With record rainfall hitting parts of the east coast, HLN’s “Across America” used augmented reality to show viewers the dangers of driving in water. Anchor Carol Costello tossed to meteorologist Chad Myers in CNN’s weather center in Atlanta, who gave a detailed overview of the forecast on one of the studio’s large video panels, emphasizing the high potential rainfall totals. 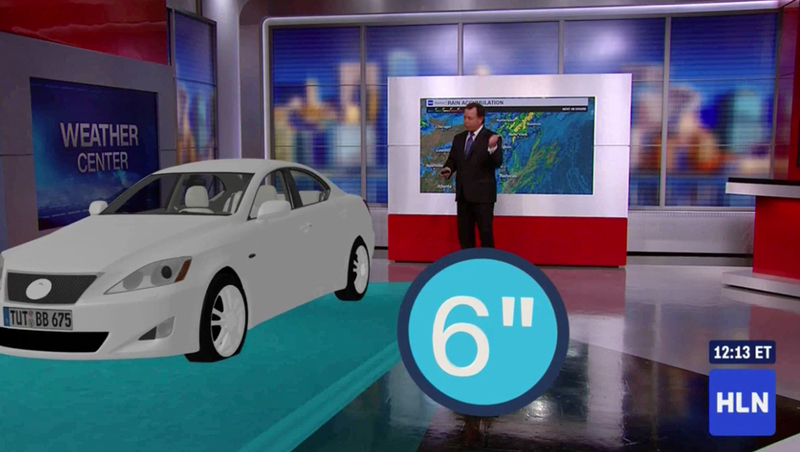 “So what does four, or six, or ten inches of rain do to your car?,” he asked as the camera zoomed out to reveal an augmented reality “block” of water with a white virtual car. A circle badge indicated the water level, which increased as Myers went out — with the car eventually being “washed away” off screen, leaving Myers standing next to a virtual block of water. “That was a freaky graphic, but quite effective,” said Costello after Myers tossed back to her.